I really can't believe that I haven't posted about our incredibly delicious, itty-bitty, whole-wheat biscotti. We've made them several times now, and for various occasions: Thanksgiving, Christmas (they make fantastic gifts), dinner parties, and that time I felt like eating 20 biscotti in one sitting. Ok, that happens every time we make them, but I'd still call it an occasion. Jonathan posted about pumpkin biscotti a while back, but these little dunkers are a whole different animal. And by "whole" I mean "whole-wheat." Yes, that's right, these are biscuits of pure health. And I like making them really small, so they're pretty darn cute, to boot. 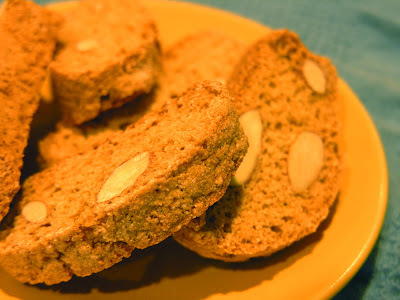 Our latest excuse to make biscotti was an assignment from one of my favorite food bloggers, Jaden, of Steamy Kitchen. Eminently famous and highly esteemed, Jaden was recently asked to test a new food product: single-serve spices. The spices come in little packets (1 teaspoon each) and include everything from green cardamom to ancho chili powder to anise seed. Which is where we come in. 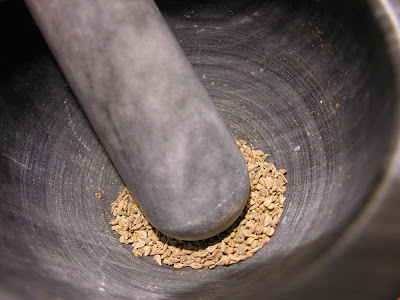 Jaden asked her readers with some help with the testing, and we jumped at the chance to a) get some free anise seed and make delicious biscotti, and b) hopefully make an appearance on her blog, thus making this blog famous and increasing its readership 10-fold. So far, a) has worked out really well. 5. You slice them up after baking them, and then you bake them again! I'll post the exact recipe at the end, but here is a biscotti-making primer for any first-timers out there: Measure and then mix the dry ingredients together (look at our anise seed!). Add the eggs, extracts, and tidbits (nuts, raisins, chocolate chips), kneading if necessary to incorporate all of the dry ingredients. 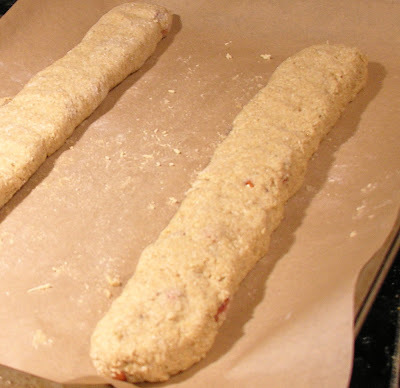 The dough will be pretty sticky, so flour your hands if necessary before forming the dough into two long, thin logs. 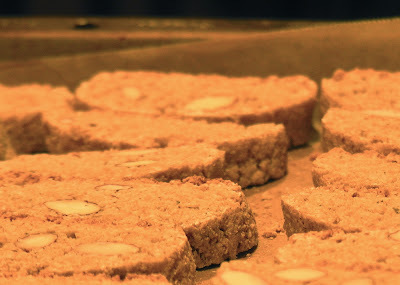 Place them on a parchment-lined baking sheet, flattening them a bit so they get that nice biscotti-shape when they bake. 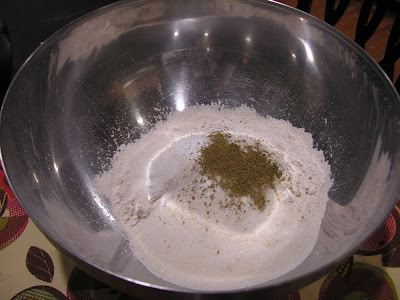 Bake until cooked through and no longer soft, then let cool for a few minutes. Once you can handle them, slice them into biscotti. You can slice on the bias if you'd like, but I go straight and slice them thinly, so that they are quite small. Tip them all on their sides and return to the oven for 10 or 15 minutes, until lightly golden and crisp. Flip if necessary (I usually don't flip them). Instead of going through the instructions again, I'll just give you the basics: Form the logs so that they are about 12-14 in. long. Bake at 375 degrees for 25 minutes, then remove and slice. Return to 375 degree oven for 10-15 min. more, until crisp. Eat continuously for the next day and a half. 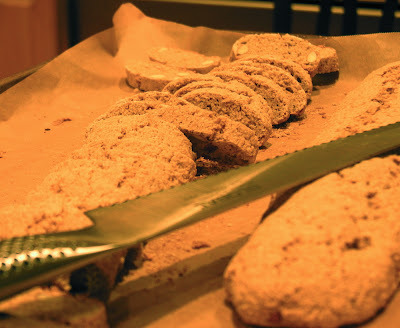 Steamy Kitchen readers: I can tell you first hand that Mia's biscotti are phenomenal... and, of course, healthy and cute! Those biscotti are beautiful! I love that you use WW. What a great idea! Now eating biscotti are healthy! 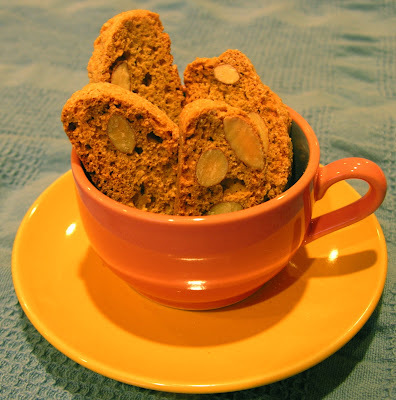 What a great idea to make biscotti with these! I would never have thought to make this! This would go great with a good morning cappuccino!